These PYREX® Distilling Flasks are suitable for microchemical applications. The sidearm is approximately 77mm below the top of the neck, positioned at a 75° angle. 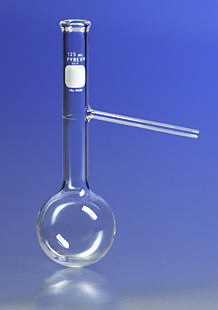 Adaptable for use with thermometers calibrated for 76mm immersion. Flasks accept a No. 0 rubber stopper.